Virginia Beach leadership may not care about the tolls but their citizens do. Portsmouth is not alone in this fight. Del. Kenny Alexander, whose district is in Norfolk but who owns a business in Portsmouth, is considering a lawsuit and has teamed up with Patrick McSweeney. Del. Chris Jones, who represents Suffolk, wants the state to scrap the deal. 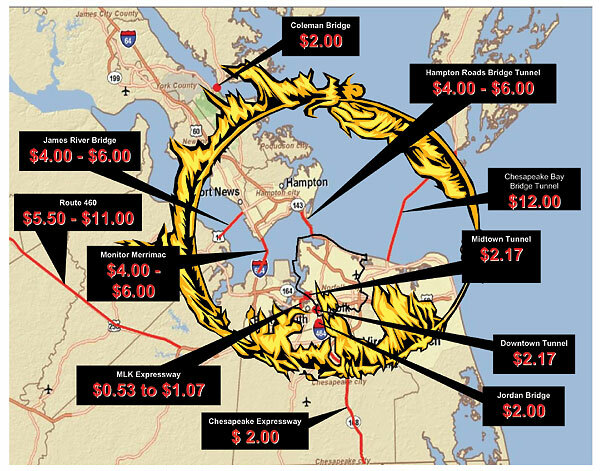 The deal is a bad one for Hampton Roads. Not only are the tolls too high, but the regular increases and the term of the deal, not to mention the profit the company is allowed to make, are just too much. Yes, this amounts to kicking the can down the road. But Hampton Roads cannot afford this deal. Previous Post Behold, the green and gold! Couple of things, Jones is willing to scrap it only as a “last resort”. More importantly, Sessoms is parroting Fraim about this isn’t a good deal but we “need” this bad deal! I would rather have no deal than a bad one. Think I have said that before, but I’ll repeat until folks hear it. Yeah, but at least Jones is willing to go there. And that’s good for us. It’s sad when local politicians feel they must make a deal with the devil in order to achieve What?